Today has been one of those "I know I'm a mom" days. We met up with my BFF Laurie at Olive Garden for lunch. Seriously - the soup, salad and breadsticks lunch is my favorite thing EVER! They probably run when they see me coming because I want so many refills. ha! After lunch - Harper and I headed to Target. It was time to buy the big girl car seat. I can barely get her buckled in her infant one anymore - we have exceeded the 20 pound weight limit. We have a lot of holiday travel coming up so it could wait no longer. So I go out to the car and put Harper in the car first. It's 40 degrees today and very cold. I drop my keys and phone in the front seat and go to load the car seat in the back. My car never automatically locks and I've always been meticulous about checking to make sure it doesn't. And this sweet girl pictured above, Savannah, comes out. She asked me if I was okay? I told her no and could I borrow her phone. and then she says............"Wait - are you Kelly? From Kelly's Korner? I read your blog and you have been an inspiration to me" and I thought "well - all that is going to change now that you have met me and realized I'm crazy and I'm standing in a parking lot with my baby locked in the car" ha! She very sweetly called the police for me and at least 3 cops came to my rescue within 5 minutes! Thank you SO much Savannah - you saved me today! I couldn't have been helped by anyone nicer! 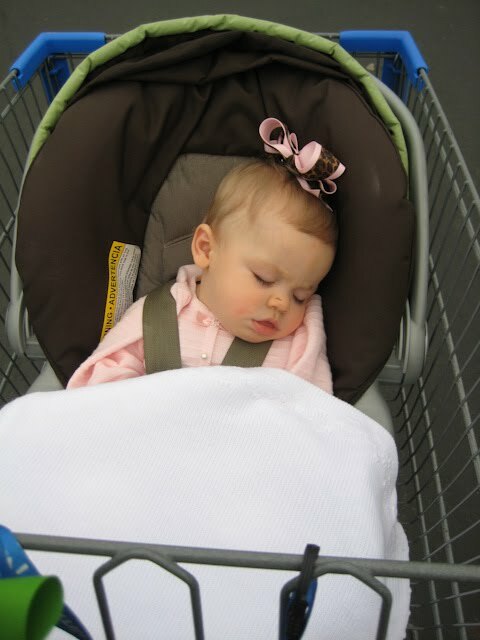 Then we headed to Wal-Mart and Harper was so tired by all of the afternoon's adventures that she slept through our visit. Yes - Wal-Mart and Target all in one day. This was the last day I can take Harper in in her car seat and put her in the buggy. We are moving to the big seat tomorrow!! Several of you have asked me a few things about my trip like how do you get to go on one and how has the trip changed me. I was going to write about all that today but I thought I would share my crazy day instead. I'll write about it tomorrow - so if you have ANY questions about my trip or Compassion - ask away and I'll answer tomorrow. And in the meantime - I have a very exciting giveaway going on HERE. And a blog friend is giving away something from Kerusso which is an organization that supports Compassion - so I'd love for you to check it out HERE! first comment? ?i always wanted to be first!! Glad all was well and you had a sweetie to help you out! Thanks for the Kerusso giveaway mention!! Bless your heart, my friend! But it sounded like you handled it like a super-momma and I am so glad God sent you a sweet helper! How cute and sweet is that Savannah?? Love this story (minus the stressfulness/panic I am sure you were feeling in the moments before help arrived, of course)! Love you dear! So glad you and Harper are safe and sound!! We ALL have those moments!!! Thanks goodness the Lord provided someone in your time of need!! He's AWESOME!! Can't wait to hear more about your trip!! I can't wait to hear the answers to your trip tomorrow. oh man, what a day! Glad it ended well!! So sorry that happened to you today. That happened to me one day but it was at the tire auto store of all places so they were able to get the door opened. I was so paranoid - there's something so scary about a baby locked in the car no matter what the temperature! Would you be interested in having me do a bow giveaway on your blog and somehow Compassion benefits? Just wanted to tell you that it looks like you have the Graco Safeseat Infant Seat. If so, you can keep Harper in there until she is 30 pounds or 32 inches. whichever comes first. i do not want to start a debate but i wanted you to know if it's easier for you you don't have to switch seats yet. If I am wrong about which seat you have (maybe it's a snugride but it doesn't look it) I'm sorry. That's ok, I've done it twice. The worst part? My daughter was 2 both times, and she thought it was hilarious. I was banging on the windows both times, trying to get her to push the button and unlock the door. The first time, she finally did, after laughing for forever about the fact that she was in car and I couldn't get to her, she thought it was hilarious. The second time, I banged so hard, a lady cleaning the neighbors house though something horrible was happening and called the cops. They got here and were able to unlock the car, they weren't really supposed for liability reasons (could have torn up car), but I didn't care, I had my daughter and I didn't have to pay $50 for a locksmith! Must really be a mommy right of passage. I am glad things turned out ok for you! I am amazed though how you had a camera on you with everything else in the car! How precious! Talk about a sweet God moment - I love that that precious girl was able to come to your rescue! The big girl car seat was such a traumatic time for me! In CA the baby can't be any bigger than 20# OR 26". My kid who was 21" at birth hit 26" in like 4 1/2 months! She couldn't sit up by herself yet and I had to get a new car seat! Ack! It made grocery shopping pretty hairy there for several weeks - she ultimately just shopped with me strapped to my chest in the Baby Bjorn...she loved when we had to get frozens out of the great big freezer! I got my money's worth out of that seat though! She rode in that thing from 5 months to 5 years! I only just replaced it with a booster last month! If it makes you feel any better, I locked my daughter in the car with my keys on Monday night! The good news is we were in our own driveway, the bad news is it was our only key. She's three and knew there was a problem. After much crying on her part (and mine) and much laughter from my husband and our mechanic, we rescued her. She has reminded me everyday not to lock her in the car :). Here's the best thing about the carseats on the market... they are ALL safety approved or they wouldn't be allowed to be sold! So there is no WRONG choice. We all may have our favs, but as long as they are installed correctly, and the straps are nice and snug against your baby... it's safe!!! Wahoo! P.S. if you have never been to a carseat safety check, I highly recommend that you go. They taught me things that I would have NEVER known about safety and I feel so much better knowing that everything was installed correctly and the straps are at the right height. I'm coming out of "lurkdom" to tell you my story and let you know that you are now part of an elite group of moms! I've been a mom for 23 years. At year 1, I took my sweet 15 mo old, who was just recovering from an allergic reaction to an antibiotic (covered from head to toe in nasty rash splotches) out to the car, which was parked in the Texas sun in the middle of July. I buckled her into her car seat, after sitting my purse on the floorboard, locked the door and shut it. THEN I realized that the keys were locked inside, with my baby, and I hadn't started the car. It was a gazillion degrees in there. This was before cell phones and all my neighbors worked. I started crying, panicked for a minute, then broke my own house window and climbed through to call the fire department! They sent out an ambulance and fire truck, both with sirens blaring, broke into my car, with my sweaty, screaming baby, then PULLED BACK, asking "What's wrong with her"?? I yanked the guy back and grabbed her myself...I guess he thought she had some horrible contagious disease! Yep, happens to the bet of us! Just be glad you were able to get someone to get you in without paying a fortune! What a day! I maybe seeing things but it looks like your straps on the infant seat can go one higher? It is a bummer to move to the big seat because no more sleeping through shopping trips!! Awww So sorry you had such a crazy day! You will totally look back nnd laugh if you arent alreday! I feel your pain! Thank goodness we had OnStar when Lyndon was born b/c I called them at least 5times!!! Sad I know-they probably thought I was the worst mother! The last time it happened Lyndon was about 2 years old and I had borrowed my mother-in-laws vehicle while mine was in the body shop and she didn't have OnStar. I started the car because it was cold and buckled Lyndon in and went to open my door again, but ... it was locked. I was on my way to work and had to call to say I would be late and my husband had to drive 15 miles to me to bring a spair set all while Lyndon screamed and cried. I tried to calm him out-side the vehicle, but it didn't work. I was very close to breaking a window. It never happened again-thank goodness. I am sure you are thinking I am a very hard learner, but it just happens so easily! What an eventful day! Buying a car seat is a time consuming process. We are to the tall booster seat now and that still required lots of research to find what we though would be the best for us. Oh wow! This is my biggest fear, ever. Don't feel bad though, it could happen to anyone! So glad you had a gaurdian angel with a cell phone! Anyway, looking forward to hearing even more about the trip! Oh, girl..... your "mom day" was bound to happen sooner ot later, haha!!! You just got it over with sooner rather then later, ha!! And I'm sure there will be plenty more. Thank God for police and sweet people like Savannah!! :) And it pays to be well-known, LOL!! i love that you call the shopping cart a buggy! Can you talk a little bit about how you selected the place to visit with Compassion and the costs involved. I have always wanted to do mission work, but with two small boys I figured I was out on that for a while. What about going with your spouse? Do you recommend only doing it that way? Wow...Kelly! I think all of us Moms have had a day like that! Mine are older and I still have those days! Ha! So glad you were helped out by such a sweet girl! There are still so many preciously thoughtful people in this world that still will help out a stranger. Way to go SAVANNAH!! Looks like Harper was a trooper for you today! Hope you have a great evening! We just bought that car seat for the exact same reason. Sorry about your crazy day! At least you didn't have to pay someone to let you in! I just love your blog Kelly. Here I am having a "feel sorry for me" day and you cheer me up with your Mom tales! WOW! What are the odds of the one person approaching you being a reader of your blog??? That's hilarious!!! i just emailed you, but just wanted to say it was SO fun to get to meet you; even if it was under such crazy circumstances. hope the rest of your day was less eventful! you're great. Hi Kelly! I've read your blog for awhile, but haven't commented before. I think I came across your blog when Harper was in the hospital and started following and praying for you all then. Anyway, I HAD to comment on this post. We just moved to NWA three weeks ago (from Dallas) and week two, I got a speeding ticket in Rogers and I think (I am like 99.9% certain!) 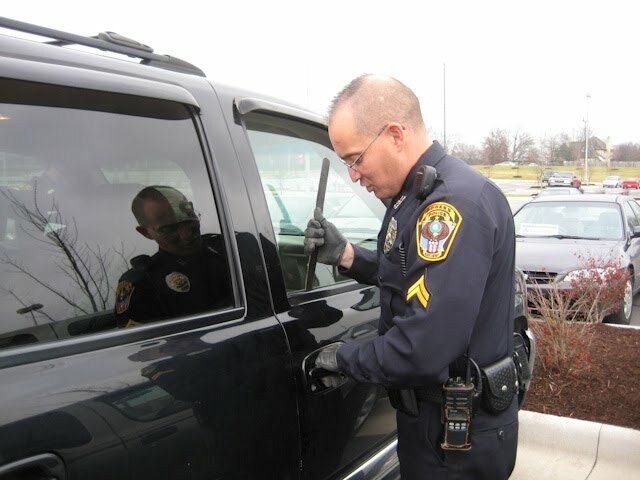 that the officer who opened your car is the one who gave me a ticket --- small world! Glad everything worked out OK for you and Harper today! Glad you had a quick rescue and it was on a cold day instead of a hot summer one. I hate those auto locks that are on cars. I always roll my window down a little so I have enough room for my arm to fit through the window just incase it does auto lock on me. Oh girl, I have days like that all.the.time! You are so not alone! Were you sad today about getting Harper a bigger car seat? I think I cried more on that day than the girls' 1st b-day, but I'm just silly like that. :) My girls are 18 mos. old now and still rear facing. Not b/c I had any preference, but they are still happy as little clams and as long as they are happy, Momma's happy! Savannah is probably glad she went to Target looking so cute today, since she had her picture taken. I would have been there with no make up and sweats. My husband, a fireman, gets kids out of the car ALL the time. So it's just a right of passage really. you make me laugh! I am glad everyone is safe and now we can laugh with you about your crazy day. I know that officer--Officer Dominguez! Great guy!! I’ve been a lurker since my daughter was born, but I have to comment and tell you I’m glad to see I’m not alone. Last month I put my keys and purse on the back seat next to Olivia, left the door open and went to the trunk to get the stroller out…then I heard the door close. Yikes! I had to yell at someone across the parking lot and ask to use a cell phone. Thankfully my hubby was close by and came to rescue us. We’ve vowed never to tell anyone about it. Ha! Now I also have spare key in my pocket just in case. We’re about to change to a new car seat too. Only I’ve had mine for a month. Right now it’s sitting in my dinning room so I can look at it everyday and talk myself into installing it. I’m going to miss the convenience of a carrier! I don’t know if you’re planning on getting it installed, but I’d recommend it. You can take it to your local fire or police station. It always makes me feel safer. Good luck. It’s a big step! I did the same thing with our middle child one hot summer day. Strapped her in the car seat, closed the door & realized my purse & keys were in the front seat and my car had automatically locked of course. A nice policeman came to our rescue that day as well while my daughter screamed at the top of her lungs in the car! Don't feel bad...we've all been there! Glad you had a productive, fun day anyway! kelly, you are too funny! it happens! God was watching over you both! Oh you are too funny. Don't worry- it happens to everybody- just be thankful it wasn't the middle of July. I don't want to cause a carseat debate either, but I have the same Graco Safeseat carseat and it goes to 30lbs or 32 inches so you can get a little more use out of it if you want. We used ours as long as we could because the other seats are so much harder because you can't move them as easily from car to car. I so feel your pain. I did the EXACT same thing just a few months ago with my daughter and my car is supposed to be the same way, not to be able to lock your keys inside. The only difference, we were leaving the doctor and she was sick with a fever. I felt terrible. Ohhhhh Kelly, I feel your pain! When my oldest daughter, who is now 4, was around the same age as Harper I was leaving my jazzercize class and a similar thing happened to me! I was in a panic and since I was the last one leaving class (I had stayed so long chatting that I was leaving after everyone else!! Go figure!) there wasn't anyone coming out of the community center who I could ask to stay by my car or to borrow a phone. FINALLY a very nice gal came out and told me she didn't have a phone, but that she'd stand next to my car and make silly faces at my daughter while I ran into the community center to call for help. As I ran back in, I almost ran smack into the chief of police and fire chief who were at the center for a meeting, and as they laughed about not knowing if they still had the skills to jimmy the lock after years of being in more desk-like jobs than on the road jobs. They did get me back in though and I was happy to be reunited with my baby--who by the way was content the whole time! So just wanted to share that with you for a good laugh and to let you know that we've all had moments like yours! You're not an experienced mom until you've experienced some kind of being locked out / kid locked in their room / etc. I'm glad you got through it with enough energy to still trek through Walmart!! Yep...you are definitely a mom. All moms have a story or two like that! :) So glad a blog reader was close by at the ready! At least it wasn't blazing hot outside. That's when it's so scary to have a baby locked in the car!! That is so cool there is a carseat that you can have a kiddo rear-face to 40 lbs! I wish they'd had that for my little one (now 4.5). We have that Graco Nautilus so she can be in the 5 pt. harness 'til she's 65 lbs. Also very cool! The same thing happened to me in my rental mini-van last Thursday visiting my parents in Florida! Police, firetruck, everything. I had one kid in the car and one in the cart outside. Kelly, Harper is so cute in these pictures (hello, i sound like a broken record- i say this in every post i comment!) and i totally remember these car seat transition days! ugh! they get so heavy! you will ENJOY the transition! 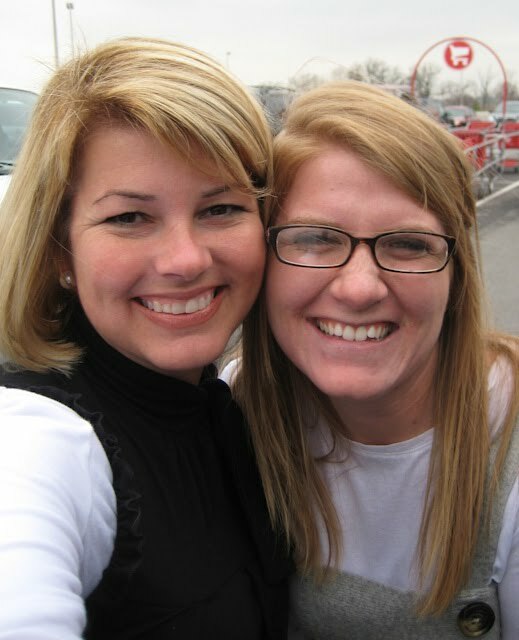 :) I am so glad God provided a sweet blog reader to come to your rescue! Blessings to you! That is too funny!! Thank goodness for kind people...who happen to read your blog!!! Do not feel bad! I've done this to my son also. He was somewhere between 3 and 6 months old at the time. Hi Kelly! I have read about this happening to so many moms, I am sure this is bound to happe to me one day too!!!! Target and Olive Garden in one day still sounds like a good day to me! :) Glad to hear everything turned out OK. I've done the EXACT thing except it was at my pediatricians office. AND I had thought to get exercise that day and park FAR out away from people. I was thankful another person saw my stress and helped me too! Thankfully, both of my kids were little and fell right to sleep! I'm so glad that everything worked out alright and how *cool* is that that a reader recognized you!!!! you know, I remember reading that you always prayed that your blog would have an impact...that's some answered prayer right there! What a day you had! I locked myself out of the house a few months ago...I was loading the twins in the car and placed my keys on the counter...locking the door behind me. Oops! wow, I would have been bawling!! Sorry that happened, Kelly, but SO thankful that Savannah helped you!!! I also LOVE that you call a cart a buggy. Me too. And people here look at me like I'm a loon. We picked J up from the airport tonight and went to Olive Garden. I love their soup/salad/breadsticks too. It's all I ever order!!! This was one of my worst fears when I was a Nanny. I would never shut the doors for any reason until I got the kids out of the car. I'm so glad that somebody was there to help you. The fact that you had the diaper bag and your camera to take pictures of the event cracked me up. I hope you and Harper had a good time shopping. Just so you know, if someone has your automatic door lock they can press it while on the phone with them and it works. I've tested it, it really does work. When My Buddy Bear was 4 weeks old My Husband was deployed and happened to be in Spain on crew rest that day (Thank God!) I was up at 4am nursing my Buddy Bear and I suddenly remembered I didn't put the trash can out and it was trash day...I better go out and do that before I forget...I finished nursing him and layed him back down in his bassinet and ran outside in my slippers, tshirt, and shorts...at 4:30am...I put the can out on the curb and ran up to the door and it was LOCKED!! I put my ear up to the door and I heard Buddy crying and I panicked!!! I'm so glad for wonderful neighbors and wonderful blog readers that save the day!! Wow! What a small world :) Glad she was able to help you out! From reading your posts, obviously you are NOT alone. and umm well I have to admit that I not only locked my daughter in the car ONCE, but TWICE. The first time was at Marshall's she was about five months old. My keys, phone and purse were inside the car, I Was so upset I started crying and then thankfully someone stopped and let me use their phone. The second time was at Kroger grocery store...I felt so terrible, you would think after one time that you wouldnt do it again...so now I ALWAYS make sure I have the keys with me or I always leave a door a little cracked so it wont lock automatically!! So don't worry, you are NOT alone..your a great mommy!! I know that's going to happen to me one of these days. I just hope it's when it's cold out and not 110 degrees. How nice of the Lord to send you a person of peace in your time of need! Bless your heart, and bless that sweet Savannah's heart for helping a sister out! I am always SO paranoid about locking the kids in the car, in fact, mine locks automatically anytime the back hatch is opened and closed so I always roll down a window just in case! to be there to help you today. God sent you an angel. My third daughters name is Savannah and it is my favorite name in all the world. I named her that b/c in the 4th grade I was the movie "When Savannah Smiles" and knew I'd have a Savannah one day. Then I married a man from Minnesota and he could not imagine naming his daughter such a Southern name ... until we had 3 of them. When she was born he said ... "let's name her Savannah. I think God is going to give us girls until you get a Savannah." And 2 1/2 years later we had a little boy. Oh my gosh! LOL! That's hilarious! LOVE that it was a blog reader who rescued you! As for car seats.... your seat rear faces until 30lbs! Just based on the pic from today she has TONS of room to grow still. Im SOO excited to see your planning to practice rear facing. And I know this is not a debate- but Im concerned about what some people have posted.... there are NO state laws anywhere requiring people to take their child out of an infant seat at 20lbs or switch them forward. A day that you will look back with a good laugh!! About the car seat... I couldn't wait until they were big enough to be front facing so I could see them in the rear view mirror & so they good have a better view out the window... We tried Graco, Britax Boulevard and Recaro Young Sport for our 2 girls. The Recaro was our favorite (and suppose to be extremely safe). They still use them and love them. The car story was sooo funny! The good side of being "Blog Famous!" I love asking questions when people have been on missions trips! 1. Will the Stamps family be incorporating any customs or food from El Salvador from time to time- it could be a fun way to teach Harper about Daniela and where she lives as she grows up. 2. After all you have seen, smelled, heard and experienced this past week, how have your thoughts changed on life in the West (First World Countries)? So sorry to hear about locking your precious cargo in the car, but what are the odds that someone who reads your blog stops to help you?! Too Funny! I really enjoy reading your blog and can't wait to hear more about your trip! Advice for the day: Get one of those doo-hickeys that puts a numeric code on the outside of your door to unlock your car. We did that for my daughter when she went off to college because the cops in North Alabama and North Mississippi claim they can't break into a car like your photo showed. And we knew she would lock herself out. It's been wonderful -I have demanded one for myself! Especially since I once locked my keys in the car with the CAR STILL RUNNING!!! My face is still red. Love reading your blog. I'm so glad to know that I'm not the only one that has locked their child in the car. A word to the wise...when the child gets about 3 they can lock themselves in the car, and think it is really funny to refuse to unlock the doors! Keep your keys handy. Oh my! I'm so glad it worked out OK! Poor Kelly! I would've probably passed out from anxiety! Glad y'all are okay...hope your Caramel Apple Spice was still warm! Oh my stars, I'm always so worried about that!! Thank goodness you had help right there in the form of Savannah (a God-send! ), and that it wasn't a hot day! I look forward to reading more about Compassion! Just keep the carrier in the back of the car and you can still put her in it for store trips. We did this with both kids and it was a big help. God puts the right people in your life at just the right time. What a blessing that she was there! I locked my oldest (now 9 years old) in my husband's Silverado years ago. Cam was only 15 months old. I'm still not sure how the car locked. That truck doesn't lock if you keep the keys in the ignition, but I had pulled them out and laid them on the console. As I walked around the truck I heard it lock. Of course, Cam was still strapped in his seat, so he couldn't unlock it. I was panicked. I was in a rural area at a gas station. My mom was there with me, thank my JESUS she was! I would've been a basketcase! We called the sheriffs dept. and state troopers. They told us they didn't have anyone who could come out right then. Did I mention my baby was locked in a black truck, with black leather seats, in July, in Alabama????? I was totally flipping out! It was getting HOT in that car. I tried to keep Cam calm, I played peek a boo with him and made faces. Finally I remembered OnStar.....now this was 8 years ago.....OnStar was a pretty new thing. So I called them and they sent down a satellite signal and unlocked the doors!!!! I was so thankful for technology that day!! Needless to say....I have had OnStar in every vehicle since! Kelly, long after Aaron graduated to the big car seat, I kept his infant seat in the trunk. When we went to Walmart I would put him in the infant seat and put the infant seat in the cart. It was a better shopping experience that way. I would also use it in restaurants for a while. Sounds like an exciting day! I'm glad you and Harper had a quick rescue and even met a friend in the process! I too wanted to know how you got to go on the trip. Does everyone that sponsors a child get that chance? I am really thinking of sponsoring a child, I have 3 children of my own and I wanted them to help me pick out one child to sponsor but I haven’t made a 100% commitment yet because a) I don’t go to church and as I read through the compassion website it talked a lot about god and praying to these children and that brings me to b) I don’t believe in a lot of those things but I do believe in helping people in need but maybe I should find another way to do it. So that is why I am up in the air right now. I just have different views of god and church and life. What are your thoughts about this and me going through Compassion vs another place? aww, what a day! I am so glad you can keep her rear facing. They didn't know that when my oldest was a baby. I switched her pretty early, by my last I kept her rear facing till a year. I wish they had seats that rear faced longer like they do now. I remember being so bummed that she was in the yucky carts. I always wiped her hands off before I left the lot! Good luck! Hi-Ive been reading for awhile, and you 2 are just too stinkin' cute! I am a 911 dispatcher, and people lock their kids in the car EVERY single day.Its wayyy common. I never understood why people get so hysterical, as long as its not hot out. The baby isn't going anywhere, they are always nice and safe and snug in the carseat. Also, as far as a carseat goes...they are ALL safe. Just make sure it is installed properly, and have it checked by the fire department or highway patrol! I have that car seat for my son and I love it! In some ways I think the car rules are just a little overboard but I will be the first to say I want all little ones safe! Think about it, we strap them in the back seat backwards for several years; turn them around in a booster until they are 8; keep them in the back seat until they are 12 and then put them behind the wheel of a car at 15 with a permit (Tennessee anyway!). I've followed your blog since Harper was born and so enjoy reading it! I locked my son in the car when he was about 10 months old too. We got to church on Sunday morning and I realized I left his bottle at home, so my hubby went on to the early service and I drove back home for the bottles. When I got back to church I accidentally locked the door, keys and all inside. Thankfully he was sleeping in his car seat and it was cool weather. There was no one around since it was the middle of service and I didn't want to leave him. We were new to the church and didn't know that many people. Finally, a couple of people started to arrive for Sunday School and I asked a gentleman to please stay by my van while I went to get my husband. We got it unlocked and got him settled in the nursery for Sunday School. When we picked him up the very same gentleman was helping out in the nursery! I look back now, 11 years later, and get a good chuckle but I was devistated that day! OMG! It's Savannah! I know her! haha Small world! oh my gosh Kelly, how scary for you!! I would have freaked out! That is so lucky that a sweet girl could help you, glad it worked out okay!! I've done almost the same thing but WAY dumber. My almost 2 year old wanted to play with my keys and I ley him while he was in the car seat. I went around to get him out and as I walked around the car HE locked me out. I had to bang on the door until he unlocked the car. I was this close to breaking the window. Fortunately it was not hot out and he laughed at me the whole way through it. Haha! It wasn't funny to me then but it is now. Note to self: never let baby play with car keys while IN the car. UGH! Wow, I know that had to be scary. Yay, for sweet people in parking lots and fast policemen!!! I did the same thing when my son was about 9 months old! Put him in along with purse etc. then loaded groceries into the back and as soon as I shut the back doors heard a click. I thought I know my car didn't just lock with my baby inside!!! Yep it did! Horrible feeling!! This is going to see silly... but we kept the "baby seat" in the car for a while even though we had moved to a bigger seat because our son was a chunky monkey. I know silly, thought I would help. (AND THIS IS NOT A CAR SEAT DETBATE POST). Oh, Kelly!!!! That is hilarious and scary all at the same time! Bless your heart! Sounds like something my crazy self would do, too! I LOVE reading your blog. You are truly and angel! It looks like you can adjust the straps on Harper's infant seat up to the next notch. That should make it more comfy and get you some more use out of it. Good luck! I have been reading your blog for about a year now and have always thought that if you lived in NC we would be friends. Well this post confirms that...I have regualar lunch dates at Olive garden followed by trips to Target with my BFF! Oh, and just 2 weeks ago I locked me and my two girls out of the house!!! I did the exact same thing with my neice! It was 100 degrees out, so I put the AC on full blast before I loaded her. The car is not supposed to lock until you put it in drive... and sure enough, this time it did! I felt so bad, and called the Fire Department, and they helped me unlock it. It can happen to anyone, but you still feel so guilty. I have totally done that too. I was driving my mom's van (I know the code to unlock my car) and getting gas. It locked itself for some reason and my less than one year old son was in his carseat...sleeping...until I started pounding on the glass to break it. Brilliant. Now he's screaming and the gas station guy says I can't go in to use the phone but the locksmith won't come unless they talk to me. So he finally lets me in and I call 911 because the locksmith will be 45 minutes and expensive! The fire department was less than 1 mile away. Yes, that's me looking stressed in the gas station parking lot! Less than 5 minutes and my baby is out and all is okay! So horrible though!!! Glad everyone was okay. A huge fan fare here for keeping that precious girl of yours rearfacing longer! My daughter is going to be 21 months next week and is still rearfacing...not knowing she is missing a thing! Her 4 1/2 year old brothers are still in 5 point harnesses and will be picking their first date up this way too:) They outgrow their 40 lb seat soon (we grow us some small kids) but we will be buying the new graco that you can use the harness till 65 lbs! I keep telling them its just like the race car drivers:) It is so much safer this way especially traveling on the highways at higher speeds. As a former peds icu and trauma nurse I have seen enough to want to send them off on their honeymoon night in a 5 point harness:) I think Anna Claire's daddy might just do this and toss out the key!!! Love reading your blog...mishaps and all. I've never locked my kids in the car (yet) but I did drop one out of his infant carrier onto his head in the Atlanta airport for all to see. I think I cried longer and harder than he did! Oh my goodness Kelly...the very same thing has happened to me! My daughter was 8 months old and we were also at TARGET! Thankfully there was a nice lady getting in her car to leave and she let me borrow her phone! Unfortunately my husband was out of town and the police said they wouldn't come out and break into my car because of liability...hello, my BABY was in the car! Anyway, I had to call my in-laws and they showed up about 30 minutes later. 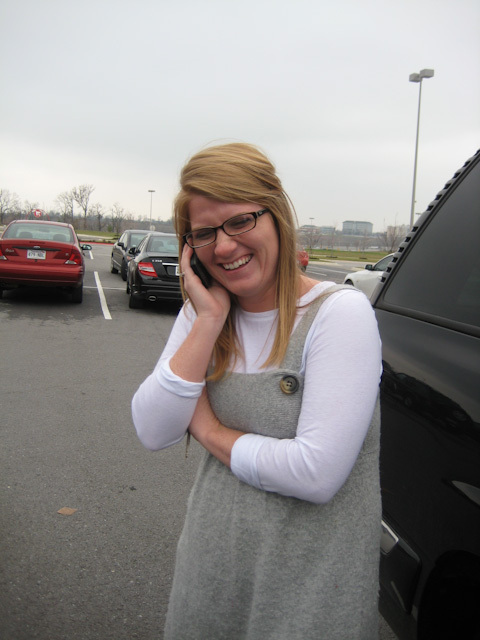 My poor Ava was hysterical by the time we got the car opened! I felt like such a horrible mother! I had just finished running with a friend, got my son and my phone (and keys) all loaded into the backseat of the truck, went around and loaded up my running stroller, shut the door, came back around to say goodbye to my friend and grab my keys from my son and in that timeframe he locked the doors with the key fob. Unfortunately he was only 2 1/2 and didn't know what he did or how to undo it. After calling the police on my friend's phone and them breaking into my car one of them suggested that I get a hide a key. I told him I was worried about having it on my car and he said that he's had one on his truck for 20 years and nothing has ever happened and a thief is not going to take the time to look for a hide a key under a car. We went out that night and bought them for both our vehicles. Now at least I know that I can get in if I ever get locked out again! I had the same exact thing happen to me with my first born at Target when he was 9 months old!!! What a sweet blogger friend!! It must be weird to be recognized everywhere you go, but what a blessing, huh?!! I locked myself out of the house the other day and had to call my husband to hurry to school to pick my girls up because that's where I was headed when I realized my purse and phone were locked in the house along with the keys. Ha! Luckily the neighbor was home! I'm glad she helped you! What a blessing for sure!!! I'm glad the cops got to you so fast and all was alright! Oh no! Lol-I'm glad everyone was okay-at least it made a great story! I completely locked my oldest in the car when she was 6 weeks old! Thankfully it was February and cold. And wouldn't you know it...not a SOUL in the Wal-Mart parking lot?!? This lady finally walked up to me and I used her phone...since mine was in the car. Well, that little girl is almost 8...and doesn't remember a thing! Phew!! She's no worse for the wear! I locked my son in the car with it running when he was three weeks old.The little boy I was babysitting decided to help me get my son in the car. I got him in and went around to put Ryan in and the door was locked. Went to the other side..locked. I walked back into Pizza hut and asked to use the phone to call a locksmith. I was calm the lady in Pizza hut was not. she screamed and called 911. The officer came and unlocked the door for me. My sone slept the whole time.